Great skin shouldn’t be a luxury. 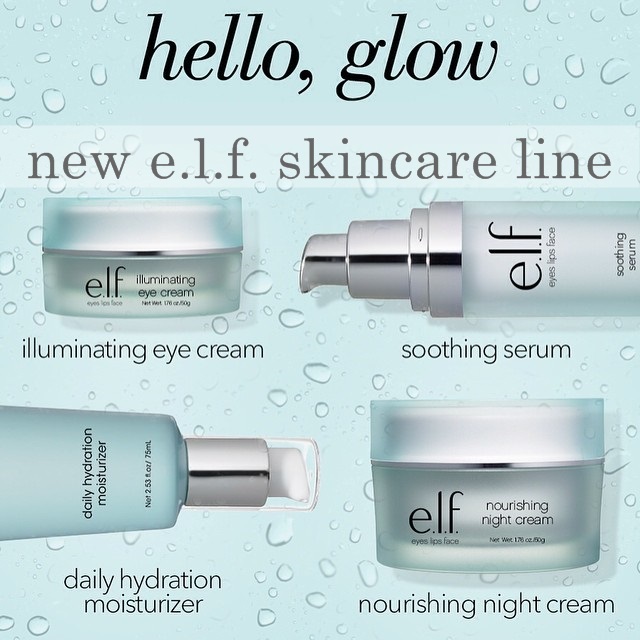 Which is why the drugstore cosmetic brand, eyes lips face (better known as e.l.f) is expanding their price conscious beauty offerings to include four new skincare products! I tend to find my way to the e.l.f. shelves during my local Target runs and pick up a few things from time to time. I mean, at under $5 why wouldn’t I?? Last time I picked up a bronzer/blush duo that gave my NARS one a run for its money! This new skincare collection includes a Daily Hydrating Moisturizer, Soothing Serum, Illuminating Eye Cream, and Nourishing Night Cream. It’s at a slightly higher price point, but it’s still FAR from breaking the bank, with the most expensive product in the line, the Nourishing Night Cream, coming in at $12. Free of parabens, sulfates, and phthalates, all of these products contain jojoba oil, aloe, vitamin E, and Shea butter. The eye cream also packs green tea, and both the eye cream and the night cream contain cucumber. E.l.f. skincare products are all available online now, and will be available at retailers like Target, Walgreens, and CVS come summer. Will you be shopping this budget-friendly skincare line? Sounds like great products. I'm always looking for inexpensive beauty products to try. I like that they have Shea butter in them. That really seems to help my dry skin.